Several 19th century artists based in Paris started the Impressionist art movement, much to the opposition of the artists that were proponents of conventional art in France during the 1870s and the 1880s. The style was fostered by the work of Claude Monet, entitled Impression, soleil levant, from which the name of the movement was derived. Impressionist paintings were characterized by several elements, including unusual visual angles, inclusion of movement, ordinary subject matters, accurate depiction of light and the passage of time, open composition and small, thin but highly visible brush strokes. They followed the styles of Romantic painters J. M. W. Turner and Eugène Delacroix. Most of the subject matters were realistic scenes taken from modern life. Often, Impressionist painters created their works outdoors instead of inside a studio. Painting en plein air allowed them to capture the transient and momentary effect of sunlight. Rather than details, they showed the overall visual effects and employed short and broken brush strokes of pure and mixed colors without shading and smooth blending that gave intense color vibration effects. Instead of the rigid studio poses, Impressionists had a different way of seeing things. There was movement and immediacy in the painting, often using candid compositions and poses, with strong emphasis on the play of light shown in the varied use of bright colors. It was Eugène Delacroix that paved the way for Impressionism, together with Théodore Rousseau and Gustave Courbet. Most of the artists belonging to the Realist movement were painting present-day life and landscapes. Some of these realist painters included Claude Monet, Frédéric Bazille, Alfred Sisley and Pierre-Auguste Renoir. They were later joined by other painters such as Édouard Manet, Armand Guillaumin, Paul Cézanne and Camille Pissarro. They learned much from the works of Eugène Boudin and Jean-Baptiste-Camille Corot, who became mentors to the younger Impressionists. Some of the techniques used by Impressionists painters were used by other artists who came before them, but the Impressionists were the first group to use these techniques together consistently in their works. The development of Impressionist style was based on new technology, including the availability of pre-mixed paints in lead tubes, which became very handy when painting outdoors and removed the tedious task of creating their own paints. There were also many new synthetic pigments that were commercially available for the first time, such as ultramarine blue, cadmium yellow, viridian and cobalt blue. In the 1860s additional colors became available, such as cerulean blue, giving the artists more pigments to work with. Their work became brighter as well. From the grey or red-brown backgrounds preferred by Renoir and Monet in the 1860s, the two artists, as well as Pissarro moved to beige or light gray background ten years later, which served as their middle tone when the painting is done. By the 1880s, off white to white backgrounds were frequently used. In their compositions, the viewer’s attention is on the main subject. The boundary between the background and the subject was relaxed, with the effect of the painting basically resembling a stolen snapshot. But while Realism focused on depicting the subject and the background realistically, Impressionism expressed their perception of nature, instead of its actual and faithful representation, allowing the artists to present what they saw subjectively. Impressionist artists developed fresh techniques in creating their paintings that gave them a very distinct look. They used short but thick strokes of paint to immediately capture the subject’s essence. They avoided using black but rather created dark tones and grays by mixing colors that were complimentary. The placement of bright colors side by side created an optical rather than physical mixing of colors, because successive color applications were done while the paints were still wet, creating softer edges as the colors intermingle. The play of light was very important to the Impressionists. They put emphasis on the way colors were reflected among objects and painted at certain times of the day to capture the pervading light, especially during twilight to seize the early evening shadows. Blue was used extensively for the shadows from the blue sky as reflected onto different surfaces. The period of Impressionism was a revolutionary period in art history. The era produced several famous paintings, highly valuable and very much admired even to this day. 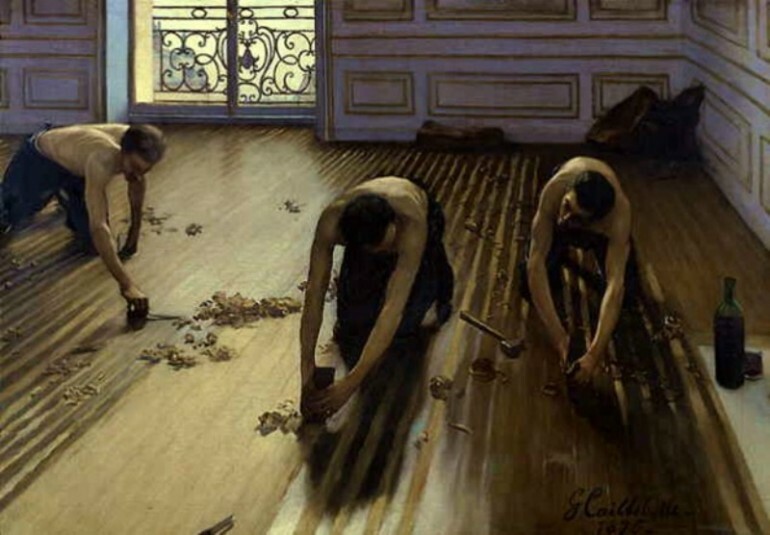 Some of these include the photograph-like The Floor Scrapers (Les raboteurs de parquet) painted by Gustave Caillebotte in 1875. Edgar Degas used Bohemian artist Marcellin Desboutin and famous actress Ellen Andrée to pose for his famous work, The Absinthe Drinker (L’Absinthe), which he did in 1876. In 1896 Camille Pissarro painted the now famous Pont Boieldieu in Rouen, Rainy Weather. 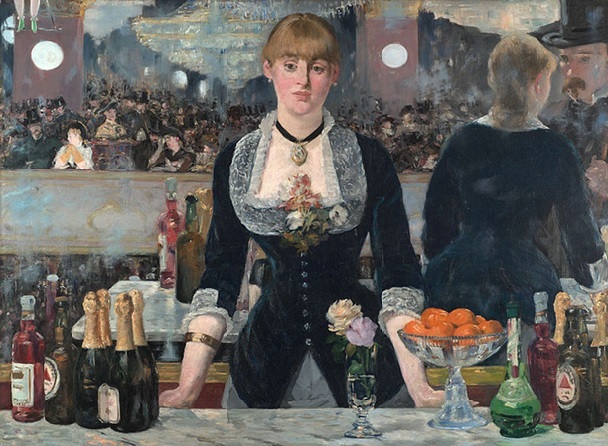 Pierre-Auguste Renoir, Edouard Manet, Claude Monet were the other outstanding Impressionist painters during the 19th century whose works continue to be studied by painters of today.